These realistic coins are also great hands-on tools to help students count money and make change in any number of “real-life” situations. They are effective additions to all money activities in the classroom. The 400 coins are divided into 100 each of quarters, dimes, nickels, and pennies. 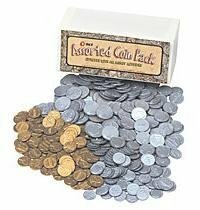 Packaged in resealable plastic bags inside a compact storage box, the lightweight yet durable coins are realistically depicted. Quarters, dimes, and nickels are in pewter gray; pennies in copper color. Highly detailed “engraving” of pictures and words make the coins fun for students as they learn to handle “real” money.